Dentures are a removable substitute for missing teeth. One of the multiple options under restorative dentistry, dentures have helped bring back the smiles of many people. However, despite their sturdy nature, dentures can still break. A broken denture can be like opening a can of worms – one wriggling problem after another. Eating is almost impossible, speech becomes inaudible, and smiling is never an option. When this happens, you can trust your Bondi Dental dentist to help you. Bondi Dental provides 24/7 dental emergency care for you and your loved ones in the Bondi community; the Eastern Suburbs; Sydney and its surrounding areas. 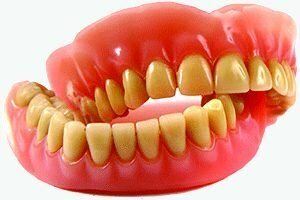 Your dentures can break for various reasons. We have listed the most common of these. Every day, your dentures receive pressure from chewing, grinding, and other normal functions of the teeth. Over time, this pressure weakens your dentures and causes them to break. Your dentures have limitations. You cannot use them for things other than your teeth’s natural actions. Biting down too strongly, or eating foods that are hard or sharp can contribute to denture damage. Dentures that are not perfectly fitted to your mouth can move around and easily fall out. Couple this tendency with progressive bone loss and your dentures are exposed to breakage. Dentures can fall out anytime if they are not perfectly fitted to you. Taking them out at night to let your gums rest also opens a window for them to fall and break. In case of broken dentures, it is important to schedule an emergency appointment with your dentist right away. This is the best way to end your inconvenience and discomfort as soon as possible. You might have seen denture repair kits available in drugstores. However, it is not advisable to use these to repair your dentures yourself, as they have been proven to be ineffective and even damaging. Fixing a broken denture requires the skill and knowledge of a dentist. So whether it is a small crack or a denture broken in two, best let your dentist handle it. Your dentist will assess the status of your dentures to see whether or not they can still be saved. For old dentures, your dentist will take a new mould of your mouth and send it to the laboratory/manufacturer for your new dentures.